Acura RDX Auto Repair San Carlos - A+ Japanese Auto Repair, Inc. The Acura RDX is Acura’s first compact crossover SUV, taking over from the MDX as Acura's entry-level crossover SUV. Knowing that many SUV buyers would rather have sporty, on-road dynamics than off-road prowess, the RDX blends sport sedan-like handling with the typical SUV traits of all-wheel drive and enhanced cargo capacity. With its turbocharged engine and "Super Handling" all-wheel-drive system, the Acura RDX promises -- and delivers -- a fun time for driving enthusiasts. It is one of the most entertaining crossovers to drive, thanks to its peppy acceleration and agile handling. It is also one of the only four-cylinder powered luxury SUVs. Driving style and the terrain plays an important part in this Vehicle's fuel economy. Uphill driving, frequent lane changes and sudden accelerations can increase turbo usage to increase torque output to the SH-AWD (Super-Handling All-Wheel-Drive) system and thus cause much higher fuel consumption. A+ Japanese auto repair has been performing auto repair and service on the Acura RDX since it was introduced to the US automobile market in 2007. With over 6 years of repairing the Acura RDX we are now known as the best alternative to the dealer for Acura RDX auto repair and service. A+ Japanese Auto Repair uses ASE Master Certified Auto Repair Mechanics and the same high quality parts as the dealership. 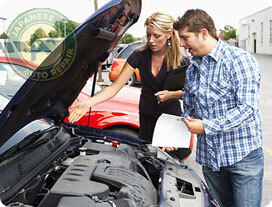 We perform these auto repairs and services at a far better price than the dealership. We also offer a 24 month / 24,000 mile warranty on all auto repair and service performed on your Acura RDX. Contact us today or make an appointment online. When it comes to trusting someone with your Acura RDX car repair and service A+ Japanese Auto Repair Inc. has been voted the #1 auto repair facility in San Carlos may years in a row.